So I am totally one of those people who goes to one of those DIY frozen yogurt shops and, instead of taking advantage of the froyo, pile on way more toppings than I really should. On a good day, my topping to froyo ratio is probably 50/50, but if I'm being completely honest with you guys, it's really more like 75/25. My toppings of choice? Yogurt chips, mini mochi squares (like these ones by the crazy talented Cynthia) and Circus Animal cookies. As for where I get my froyo, my cousin got me hooked to the Yogurtland froyo chains a few years ago; down in Los Angeles, Yogurtlands are a dime-a-dozen and are seemingly on every street corner. But up here in Oregon, the closest Yogurtland is in a fancy mall in the ritzy suburbs, about a half-hour drive from my city-dwelling, bike-commuting self. But no worries! Erlend and I would make the occasional trek out there, ending our half-hearted suburban shopping trips with scoops of tart, tangy yogurt heaped with all sorts of crazy toppings. On our latest trip, however, we were dismayed to find that Yogurtland HAD CLOSED. The one and only Yogurtland in the entire state of Oregon! As Erlend and I looked through the shuttered windows, I gave a wail of despair. "OH NO!" I said, so shrilly that several people turned around to stare. "How am I going to get my Circus Animal cookies now?!" Erlend gave me a weird look. "The real question is where I'm going to get my yogurt. You can buy your cookies in the grocery store!" He was right. Yogurtland closing was ultimately a bigger heartbreak for Erlend, who actually preferred his froyo to be about 90% froyo and 10% toppings, as opposed to my own suspect 75/25 ratio. I could just walk to the grocery store from my house, and purchase a giant bag of those Circus Animal cookies for less than $5. It occurred to me that this was something I'd never done on my own, as an adult, because I'd always associated it as some sort of unattainable childhood treat. But as a grownup, I could now do whatever I wanted to. In the Netherlands, a cup of coffee is always served with a cookie or biscuit of some kind. While I'm a huge fan of this idea in theory, the Dutch always pick the most boring cookies to serve with their coffee. You know, stuff like generic grocery store shortbread cookies, or half-hearted chocolate sables (which really, are the same recipe for the shortbread cookies with a teaspoon or so of cocoa powder added — no bueno). I like to think of this ice cream as living up to that idea, but kind of on the opposite end of the spectrum. No boring cookies in my household, nope! 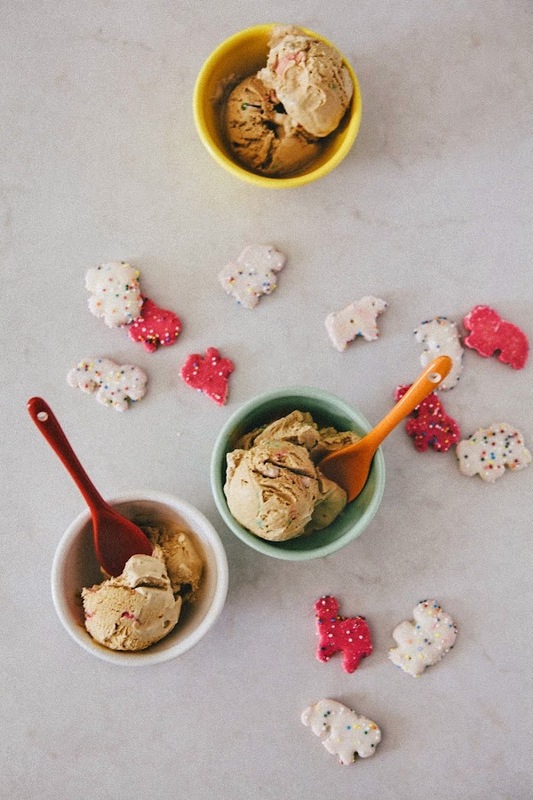 Coffee ice cream with frosted circus animal cookies for everybody!!! 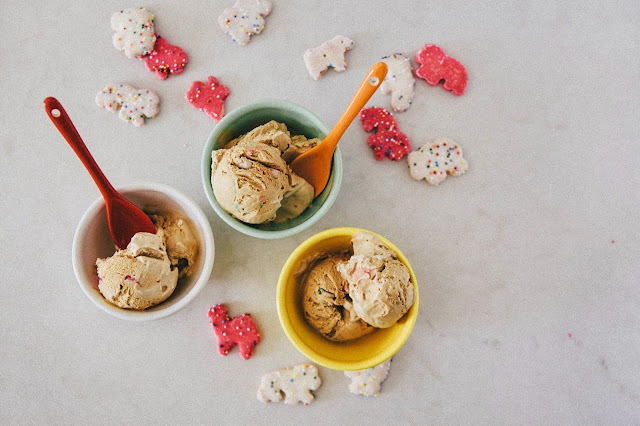 In all seriousness, the Circus Animal cookies add a nice texture and unexpected flavor to an otherwise one-dimensional coffee ice cream. But don't get me wrong — "one-dimensional" here isn't an insult. I used Nigella Lawson's no-churn ice cream (courtesy of Food52), which is simply whipped cream, sweetened condensed milk and espresso powder and liqueur whisked together to create an airy, silky smooth ice cream. On its own, it tastes a lot like Vietnamese iced coffee, which I am plenty a fan of — but some days, you just want something a little more, right? 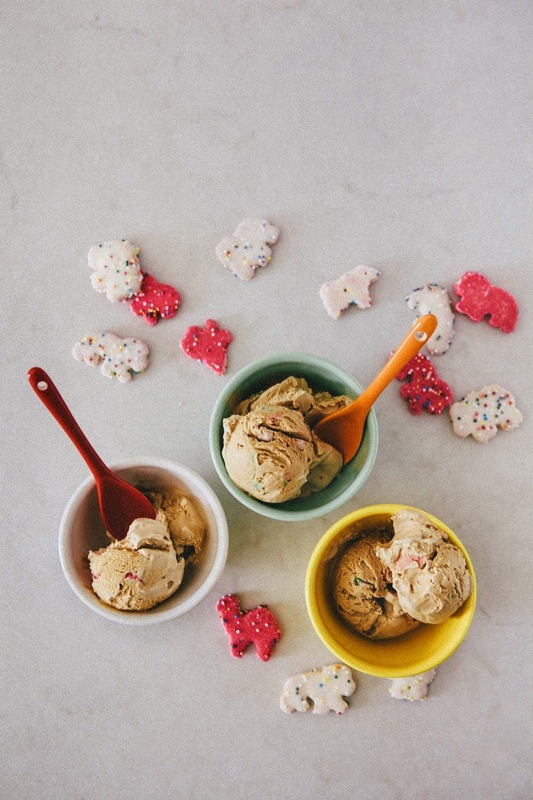 And these Circus Animal cookies do the job, adding a nice pop of color and some fun to an otherwise classically serious coffee ice cream. This ice cream really is no-churn, meaning you don't need an ice cream maker or any other special equipment to make it! 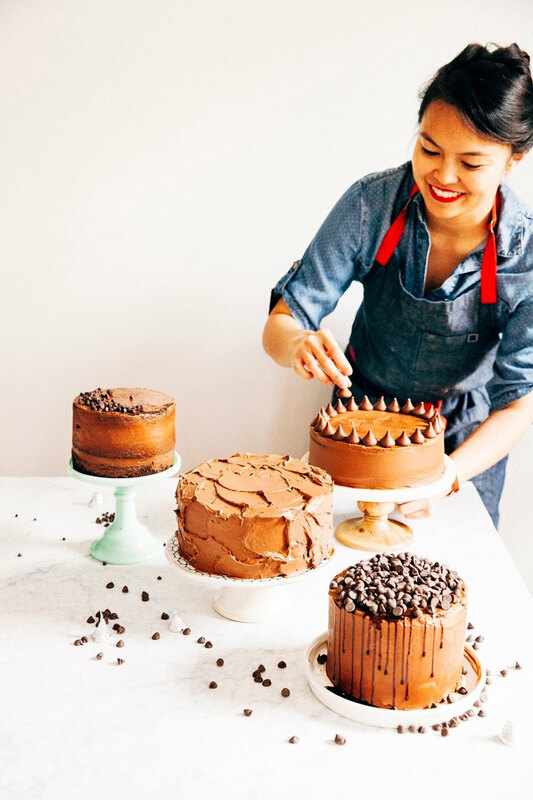 But you'll need to do a lot of whisking in order to get it to come together, so having a freestanding electric mixer with a whisk attachment or a handheld electric whisk would really come in handy unless you have arms of steel. 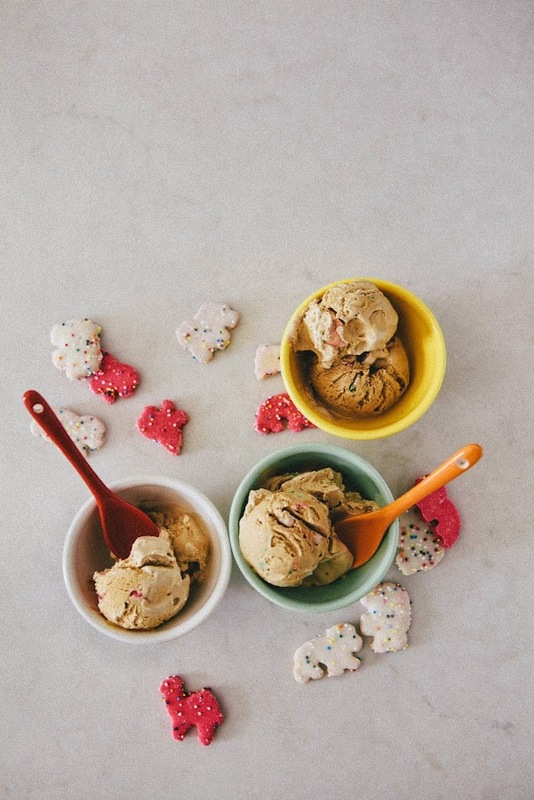 Whipping the ingredients together is what gives the ice cream its incredibly silky soft texture. Be sure your cream is as cold as you can get it so it whips up properly! If you're not a coffee drinker, you can substitute out the instant coffee granules with malted milk powder or cocoa powder and a vanilla-y bourbon or rum for the same quantities listed in the original recipe. Unfortunately, it's important that the alcohol remains in the recipe — the alcohol (along with the sugar from the sweetened condensed milk) is what keeps the mixture from just freezing solid into a hard ice block. In the bowl of a freestanding electric mixer fitted with a whisk attachment, combine 1 1/4 cup heavy cream, 2/3 cup sweetened condensed milk, 2 tablespoons instant coffee powder and 2 tablespoons espresso liqueur. Whisk (or use a handheld electric whisk) to combine the ingredients together until the whisk leaves trails of soft peaks in the bowl and you have a latte-colored airy mixture. 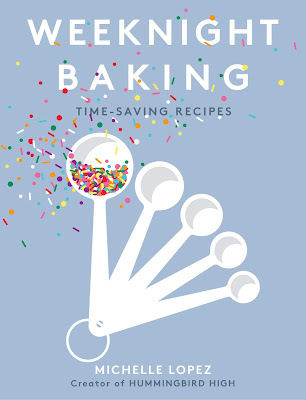 Once your mixture is soft and airy, stop whisking. 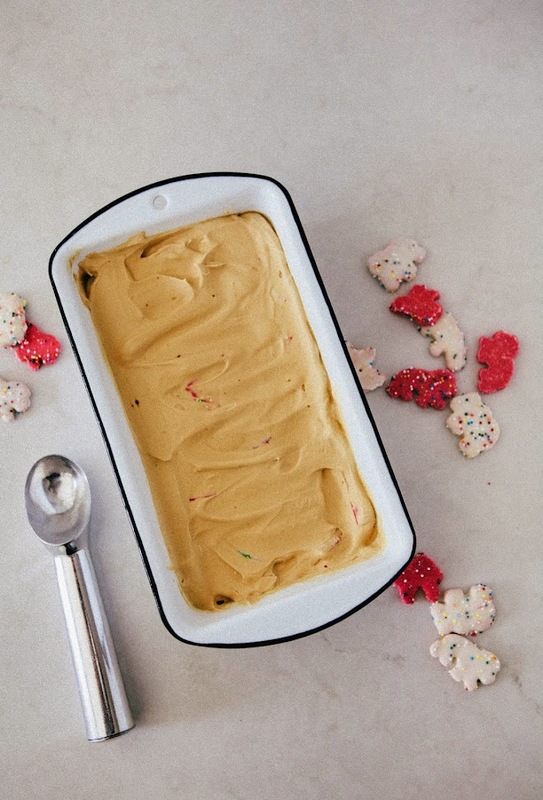 Use a rubber spatula to gently mix in 1 cup Circus Animal cookie crumbs until incorporated throughout the mixture. Transfer the mixture to a 9 by 5-inch bread pan. Cover with plastic wrap and freeze for at least 6 hours, preferably overnight. Serve straight from the freezer. What what what! Circus Animals are THE ish. I just recently made a dessert using them, so so perfect. My deepest condolences on the loss of Yogurtland, that's really depressing. wait this is so cute!!! look at those little cookies! Love your recipe & your enamel dish! frozen yoghurt just isn´t the real thing, if you ask me…. And it is awesome! For people without ice cream maker No. 1 recipe! Wow, I haven't had circus animal crackers in ages... they're so adorable and addictive - I could eat entire bags of them. Best to pair them with lovely spiked ice cream. Love Nigella and her no-churn ice cream too... thank you, thank you for sharing! Ooooomg! I am -so- addicted to those frosted animal crackers! Delicious. i am 100% obsessed with this. those animal crackers are my childhood. YES, girl, YES. I LOVE this!!!! 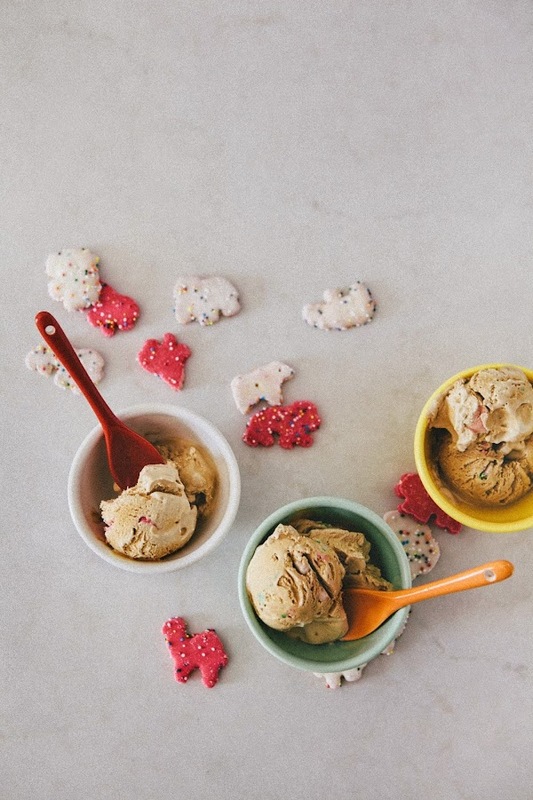 This no-churn coffee ice cream already sounds so intriguing on its own (Vietnamese iced coffee flavored? Ohh yeaahhh) and the addition of these animal crackers is perfection. AMAZING. 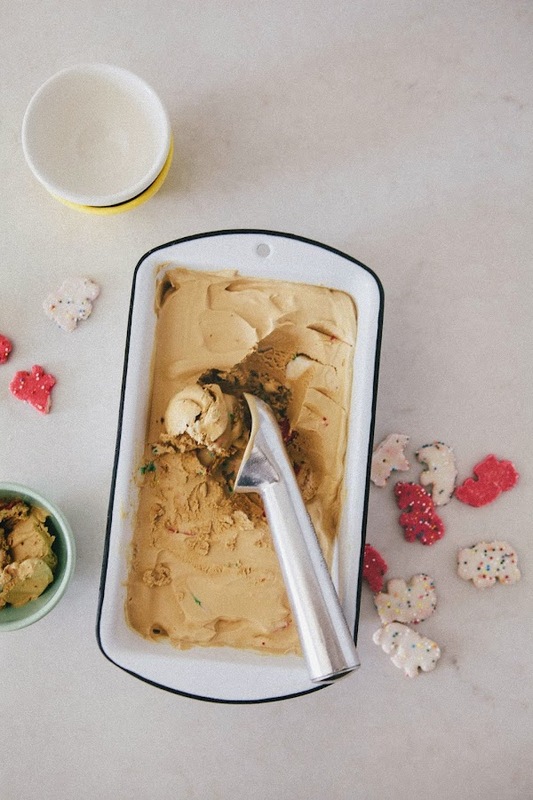 I've made no churn ice cream this way before and it's so delicious and simple. And I LOVE the little animals, too too cute. I always get animal crackers on my froyo. Love that you made this at home! CIRCUS ANIMAL COOKIE ICE CREAM!!! WITH A CAFFEINE KICK?? Oh girl, I love this ice cream creation. Anything with Circus Animal Cookies is awesome in my book. What a fun recipe. No ice cream maker? Count me in :) I left mine behind when I moved :( This looks SO good!